COLIN NAIDOO's long career in the airport industry has spanned 24 years. 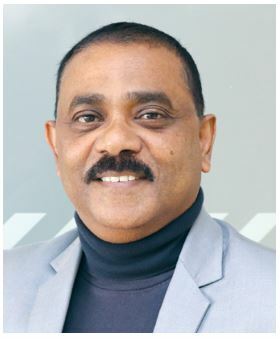 Soon after joining Airports Company South Africa (ACSA), Naidoo realised that he had found his professional calling and enjoyed the airport environment. Over the years, he has moved up the corporate ladder to reach the position of Senior Manager for Corporate Affairs of King Shaka International Airport (KSIA). Now in its eighth year of operation, King Shaka International Airport is regarded as one of the best airports in the world and has garnered many accolades over this short period. The accolades include being named the best regional airport in Africa for the past four years, the fourth best airport in the world in the 5 to 10 million passengers category (all by Skytrax) and being named the third best in Africa in the 5 to 10 million passengers category by the Airports Council International. The award that the airport is very proud of is the Skytrax for the Best Airport Staff in Africa 2017. KSIA was also voted internationally as the 10th Most Punctual Airport in the world in its category by OAG Aviation Worldwide in 2017. Naidoo says that his position includes a multitude of tasks with a focus on mainly managing external stakeholder relationships, although his responsibilities does extend to internal stakeholders. He also deals with media reporting and queries. In addition, he is responsible for managing the King Shaka International Airport brand, which he is passionate about growing. "The airport is more than just the physical buildings, we don't take stakeholder engagements for granted and we keep on working on them. ACSA's been around for 25 years, and we wouldn't have been one of the most successful state-owned enterprises if we didn't invest in our stakeholder partnerships. The political, economic and financial climate changes constantly and we have had to adapt." Due to this approach, another great accolade for King Shaka International Airport was the recent announcement of British Airways that will, from 29th October 2018, be flying direct from London to Durban with B787 900 aircraft three times a week. This was because of the collective effort of the KZN Route Development Committee (involving the city, province, ACSA, Dube TradePort, Tourism KZN, Trade & Investment KZN) and other stakeholders. The relationships that he has built with people have contributed to his success, said Naidoo. He added that he is inspired by the people that he meets every day. "Each time I walk through the airport, I feel the vibe of the space. I meet external people as well as those from the different levels of the operation itself. Over the years, I have built relationships that are built on mutual respect. Eighty percent of the current staff at King Shaka moved from the old airport so I still have these deep-rooted relationships, which I keep on renewing." He added, "I have also built solid partnerships with the business, tourist and airport related sectors. The spirit of the airport and the industry never changes and that keeps me going and grounded." However, the one thing that stands out for him in his daily tasks, and which is the motto that he lives by, is the importance of 'service first'. He uses this motto to shape his response to any challenges that he confronts and says that this outlook is what drives him on a daily basis. He added that he is always ready to help other people both at the airport and outside of it, whenever required. Naidoo's years of experience in the airport industry has prompted him to want to leave a legacy and share this wisdom with others. "With all my years at the airport it is of no use to me to keep all this knowledge. As part of my legacy, I would like to find ten people and before I retire, pass on all that I have learnt about this industry." Each of Naidoo's days at the airport is demanding. He says that as he has a long drive to work and back each day, he enjoys listening to 'good soul music' to switch off (and switch on). On the weekends, he says that he like to dress down, so that people don't recognise him as he enjoys keeping his family life private, and visits flea markets as often as he can to unwind.